↑ Farnell, Lewis R. (2004) . Greek Hero Cults and Ideas of Immortality : The Gifford Lectures : Delivered in the University of St. Andrews in the Year 1920. প্ৰকাশক Whitefish, Montana: Kessinger Publishing. পৃষ্ঠা. 269. ISBN 978-1-4179-2134-8. "The famous Hippocratean oath may not be an authentic deliverance of the great master, but is an ancient formula current in his school." ↑ Edelstein, Ludwig (1943). 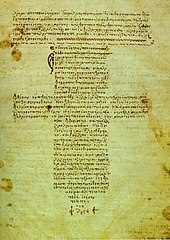 The Hippocratic Oath: Text, Translation and Interpretation. পৃষ্ঠা. 56. ISBN 978-0-8018-0184-6. ↑ Temkin, Owsei (2001). "On Second Thought". "On Second Thought" and Other Essays in the History of Medicine and Science. Johns Hopkins University. ISBN 978-0-8018-6774-3. Hulkower, Raphael (2010). "The History of the Hippocratic Oath: Outdated, Inauthentic, and Yet Still Relevant". The Einstein Journal of Biology and Medicine খণ্ড 25/26: 41–44. Hippocratic Oath, The Hitchhiker's Guide to the Galaxy (h2g2).